The Colorado Trail traverses the state from Denver to Durango and is nearly 500 miles in length, passing through six wilderness areas and eight mountain ranges. For the casual day hiker, the famous trail may be savored in small treks, easily accessed through numerous county dirt roads and forest trails. The 3-mile section from Raspberry Gulch to Mt. Princeton in central Colorado offers an easy-to-moderate trek out and back while revealing the stately, majestic faces that comprise the Mt. Princeton massif. The morning of Aug. 20 started off relatively cool, but the hot morning sun and clear blue sky indicated temperatures would be rising quickly. 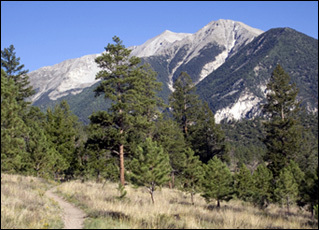 The Colorado Trail north from Raspberry Gulch offers the day hiker an easy stretch, rolling gently along a ridge on the west side of the Arkansas River Valley in the Collegiate Peaks mountain range. The well-worn trail on this day exhibited signs of hikers, mountain bikers and horses. As the trail wound through the pines, glimpses of the valley to the east and the emerging facets of Mt. Princeton to the north came into view. 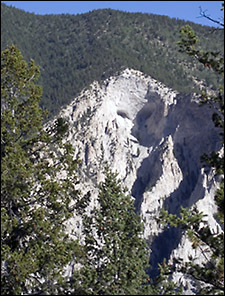 The angular peak of Mt. Princeton poked through the treetops, reminding one of the dominant feature of this landscape. The dry forest floor was littered with pine cones, while many tree trunks were charred from a past fire, although plenty of healthy young pine and aspen signaled the regenerative nature of the forest. Plenty of tree-trimming and cutting suggested that humans have helped manicure the forest along this trail. Soon, further down the trail, the stately, chalky cliffs of the south flank of Mt. Princeton appeared, fortress-like in the bright morning sun. The trail crossed [San Isabel National] Forest Road 274, then a tiny stream. As the trail continued its mild traverse, barbed wire along the trail on the left marked private property and a horse corral. Finally, the trail reached an uphill portion while inching closer to Mt. Princeton, which loses a little of its striking angularity as one approaches. At the same time, however, the hiker sees how large and complex the mountain really is, with countless faces, ridges, formations, embankments and structures. Continuing moderately uphill through an aspen grove, the sandy trail, lined with gold and yellow wildflowers and tiny daisies, soon crested as the deep valley on the south side of Mt. Princeton comes into view. At this point, the trail crossed a 9,000-foot-elevation contour line on the topo map and provided a scenic vantage point of the southern face of the Mt. Princeton massif. A lone mountain biker passed. Although it was a Saturday in late August, the trail was fairly quiet, with just a few backpackers and mountain bikers traversing the trail. The sandy trail would make this a difficult mountain bike route. This area is criss-crossed by dirt roads, perhaps a better alternative to the sandy single track of this portion of the Colorado Trail. From its peak, the trail quickly descended through a series of switchbacks, eventually crossing a dirt road with a sign pointing back to Raspberry Gulch. At this point, while a group of backpackers continued on to the Mt. Princeton hot springs, I circled back along the 3 miles of trail, returning to Raspberry Gulch. Climbing back up the switchbacks proved to be the most difficult part of the route, but a nice cool breeze greeted me at the crest. As large afternoon clouds began to roll over the Continental Divide from the west, we appreciated the gentle slope of the trail as we made our way back to Raspberry Gulch, enjoying the views in the distance of the east side of the Arkansas Valley.